Gandhāra (Sanskrit: गन्धार, Pashto:ګندهارا, Urdu: گندھارا Gandḥārā; also known as Waihind in Persian) is the name of an ancient kingdom (Mahajanapada), located in northern Pakistan and eastern Afghanistan . Gandhara was located mainly in the vale of Peshawar , the Potohar plateau (see Taxila ) and on the Kabul River . Its main cities were Purushapura (modern Peshawar ), literally meaning City of Man and Takshashila (modern Taxila ). The Kingdom of Gandhara lasted from c. the 6th century BCE to the 11th century CE. It attained its height from the 1st century to the 5th century under the Buddhist Kushan Kings. The Hindu Shahi, a term used by history writer Al-Biruni to refer to the ruling Hindu dynasty that took over from the Turki Shahi and ruled the region during the period prior to Muslim conquests of the tenth and eleventh centuries. After it was conquered by Mahmud of Ghazni in 1021 CE, the name Gandhara disappeared. During the Muslim period the area was administered from Lahore or from Kabul . During Mughal times the area was part of Kabul province. The Gandhāri people were settled since the Vedic times on the banks of Kabul River (river Kubhā or Kabol) up to its mouth into the Indus . Later Gandhāra included parts of northwest Punjab. Gandhara was located on the northern trunk road (Uttarapatha) and was a centre of international commercial activities. It was an important channel of communication with ancient Iran and Central Asia. The boundaries of Gandhara varied throughout history. Sometimes the Peshawar valley and Taxila were collectively referred to as Gandhara and sometimes the Swat valley (Sanskrit: Suvāstu) was also included. The heart of Gandhara however was always the Peshawar valley. The kingdom was ruled from capitals at Pushkalavati (Charsadda), Taxila, Purushapura (Peshawar) and in its final days from Udabhandapura (Hund) on the Indus. According to the Puranas, they have been named after Taksha and Pushkara, the two sons of Bharata, a king of Ayodhya . Evidence of Stone Age human inhabitants of Gandhara, including stone tools and burnt bones, was discovered at Sanghao near Mardan in area caves. The artifacts are approximately 15,000 years old. More recent excavations point to 30,000 years before present. To date, no evidence of the Harappan Culture of the Indus Valley Civilization has been found in Gandhara. According to some scholars, the Aryans moved into Gandhara and the rest of North Western Pakistan around 1500BC. The region shows an influx of southern Central Asian culture in the Bronze Age with the Gandhara grave culture, likely corresponding to immigration of Indo-Aryan speakers and the nucleus of Vedic civilization. This culture survived till 600 BC. Its evidence has been discovered in the hilly regions of Swat and Dir, and even at Taxila. The name of the Gandhāris is attested in the Rigveda (RV 1.120.1) and in ancient inscriptions dating back to Achaemenid Persia. The Behistun inscription listing the 23 territories of King Darius I (519 BC) includes Gandāra along with Bactria and Thatagush (ϑataguš, Satagydia). In the book "Histories" by Heroditus, Gandhara is named as a source of tax collections for King Darius. The Gandhāris, along with the Balhika (Bactrians), Mūjavants, Angas, and the Magadhas, are also mentioned in the Atharvaveda (AV 5.22.14), as distant people. Gandharas are included in the Uttarapatha division of Puranic and Buddhistic traditions. The Aitareya Brahmana refers to king Naganajit of Gandhara who was contemporary of Janaka, king of Videha. Gandhara had played an important role in the epic of Mahabharata, as the princess name Gandhari was married to Hastinapur's blind king Dhritrashtra and was mother of Duryodhana and other Kauravas. The prince of Gandhara, Shakuni was against this wedding, but accepted it fearing an invasion from Hastinapur. In the aftermath, Shakuni influences the Kaurava prince Duryodhana and plays a central role in the great war of Kurukshetra which eliminated the entire Kuru family including Bhishma and 100 Kaurava brothers. According to Puranic traditions, this country (Janapada) was founded by Gandhāra, son of Aruddha, a descendant of Yayāti. The princes of this country are said to have come from the line of Druhyu who was a king of the Druhyu tribe of the Rigvedic period. According to Vayu Purana (II.36.107), the Gandharas were destroyed by Pramiti aka Kalika, at the end of Kaliyuga. The Gandhara kingdom sometimes also included Kashmir . Hecataeus of Miletus (549–468) refers to Kaspapyros (sometimes interpreted as referring to Kashmira) as a Gandaric city. According to Gandhara Jataka, (Jataka No 406), at one time, Gandhara formed a part of the kingdom of Kashmir. The Jataka also gives another name Chandahara for Gandhara. Buddhist texts like Anguttara Nikaya refer to sixteen great countries (Mahajanapadas) which flourished in the Indian subcontinent during Buddha's time; only two of them, the Gandhara and the Kamboja were located in the Uttarapatha or the northwestern division. Gandhāra is also thought to be the location of the mystical Lake Dhanakosha, the birthplace of Padmasambhava, the founder of Tibetan Buddhism. The bKa' brgyud sect of Tibetan Buddhism identifies the lake with the Andan Dheri stupa, located near the tiny village of Uchh near Chakdara in the lower Swat Valley . A spring was said to flow from the base of the stupa to form the lake. Archaeologists have found the stupa but no spring or lake can be identified. The primary cities of Gandhara were Purushapura (now Peshawar ), Takshashila or Taxila ) and Pushkalavati. The latter remained the capital of Gandhara from the 6th century BC to the 2nd century AD, when the capital was moved to Peshawar. An important Buddhist shrine helped to make the city a centre of pilgrimage until the 7th century. Pushkalavati in the Peshawar Valley is situated at the confluence of the Swat and Kabul rivers, where three different branches of the River Kabul meet. That specific place is still called Prang (from Prayāga) and considered sacred and where local people still bring their dead for burial. Similar geographical characteristics are found at site of Prang in Kashmir and at the confluence of the Ganga and Yamuna , where the sacred city of Prayag is situated, west of Benares . Prayāga (Allahabad) one of the ancient pilgrim centres of India as the two rivers are said to be joined here by the underground Sarasvati River, forming a triveṇī, a confluence of three rivers. The Gandharan city of Taxila was an important Buddhist centre of learning from the 5th century BC to the 2nd century. Cyrus the Great (558–530 BC) built first the "universal" empire, stretching from Greece to the Indus River. Both Gandhara and Kamboja soon came under the rule of the Achaemenian Dynasty of Persia during the reign of Cyrus the Great or in the first year of Darius I. The Gandhara and Kamboja had constituted the seventh satrapies (upper Indus) of the Achaemenid Empire. When the Achamenids took control of this kingdom, Pushkarasakti, a contemporary of king Bimbisara of Magadha, was the king of Gandhara. He was engaged in a power struggle against the kingdoms of Avanti and Pandavas. The inscription on Darius' (521–486 BC) tomb at Naqsh-i-Rustam near Persepolis records GADĀRA (Gandāra) along with HINDUSH (Hənduš, Sindh) in the list of satrapies. Under the Persian rule, a system of centralized administration with a bureaucratic system was introduced in the region. Influenced by the Persians and having access to Western Asian civilizations, great scholars such as Panini and perhaps Kautilya lived in this cosmopolitan environment. The Kharosthi alphabet, derived from the one used for Aramaic (the official language of Achaemenids) developed here and remained national script of Gandhara until third century AD. By about 380 BC Persian hold on the region weakened. Many small kingdoms sprang up in Gandhara. In 327 BC Alexander the Great conquered Gandhara and the Indian Satrapies of the Persian Empire. The expeditions of Alexander were recorded by his court historians and by Arrian (around AD 175) in his Anabasis and other chroniclers many centuries after the event. The companions of Alexander the Great did not record the names of Kamboja and Gandhara, rather they located a dozen small political units within their territories. Alexander conquered most of these political units of the former Gandhara, Sindhu and Kamboja Mahajanapadas. According to Greek chroniclers, at the time of Alexander's invasion hyparchs Kubhesha, Hastin (Astes), and Ambhi (Omphes) were ruling the lower Kabul valley, Puskalavati (modern Charasadda), and Taxila, respectively, while Ashvajit (chief of Aspasios or Ashvayanas) and Assakenos (chief of Assakenois or Ashvakayanas, both being parts of the Kambojas) ruled the upper Kabul valley and Mazaga (Mashkavati), respectively. Chandragupta, the founder of Mauryan dynasty is said to have lived in Taxila when Alexander captured this city. Here he supposedly met Kautilya, who remained his chief adviser throughout his career. Supposedly using Gandhara as his base, Chandragupta led a rebellion against the Magadha Empire and ascended the throne at Pataliputra in 321 BC. However, there are no contemporary Indian records of Chandragupta Maurya and almost all that is known is based on the diaries of Megasthenes, the ambassador of Seleucus at Pataliputra. Gandhara was acquired from the Greeks by Chandragupta Maurya. After a battle with Seleucus Nicator (Alexander's successor in Asia) in 305 BC, the Mauryan Emperor extended his domains up to and including Southern Afghanistan . With the completion of the Empire's Grand Trunk Road, the region prospered as a center of trade. Gandhara remained a part of the Mauryan Empire for about a century and a half. Ashoka, the grandson of Chandragupta, was one of the greatest Indian rulers. Like his grandfather, Ashoka also started his career from Gandhara as a governor. Later he supposedly became a Buddhist and promoted this religion in his empire. He built many stupas in Gandhara. Mauryan control over northwestern frontier, including the Yonas, Kambojas, and the Gandharas is attested from the Rock Edicts left by Ashoka. According to one school of scholars, the Gandharas and Kambojas were cognate people. It is also contended that the Kurus, Kambojas, Gandharas and Bahlikas were cognate people and all had Iranian affinities. According to Dr T. L. Shah, the Gandhara and Kamboja were nothing but two provinces of one empire and were located coterminously hence influencing each others language. Naturally, they may have once been one people. Gandhara was often linked politically with the neighboring regions of Kashmir and Kamboja. The decline of the Empire left the sub-continent open to the inroads by the Greco-Bactrians. Southern Afghanistan was absorbed by Demetrius I of Bactria in 180 BC. Around about 185 BC, Demetrius invaded and conquered Gandhara and the Punjab. Later, wars between different groups of Bactrian Greeks resulted in the independence of Gandhara from Bactria and the formation of the Indo-Greek kingdom. Menander was its most famous king. He ruled from Taxila and later from Sagala (Sialkot). He rebuilt Taxila (Sirkap) and Pushkalavati. He became a Buddhist and is remembered in Buddhists records due to his discussions with a great Buddhist philosopher, Nāgasena, in the book Milinda Panha. By 90 BC the Parthians had taken control of eastern Iran and in around 50 BC they put an end to the last remnants of Greek rule in Afghanistan. Eventually an Indo-Parthian dynasty succeeded in taking control of Gandhara. The Parthians continued to support Greek artistic traditions. The start of the Gandharan Greco-Buddhist art is dated to about 75–50 BC. Links between Rome and the Indo-Parthian kingdoms existed. There is archaeological evidence that building techniques were transmitted between the two realms. Christian records claim that around AD 40 Thomas the Apostle visited India and encountered the Indo-Parthian king Gondophares. The Parthian dynasty fell about 75 to another group from Central Asia. The Kushans, known as Yuezhi in China (although ethnically Asii) moved from Central Asia to Bactria, where they stayed for a century. Around 75, one of their tribes, the Kushan (Kuṣāṇa), under the leadership of Kujula Kadphises gained control of Gandhara and other parts of what is now Pakistan. The Kushan period is considered the Golden Period of Gandhara. Peshawar Valley and Taxila are littered with ruins of stupas and monasteries of this period. Gandharan art flourished and produced some of the best pieces of Indian sculpture. Many monuments were created to commemorate the Jataka tales. The Gandhara civilization peaked during the reign of the great Kushan king Kanishka (128–151). The cities of Taxila (Takshasila) at Sirsukh and Peshawar were built. Peshawar became the capital of a great empire stretching from Bengal to Central Asia. Kanishka was a great patron of the Buddhist faith; Buddhism spread to Central Asia and the Far East across Bactria and Sogdia, where his empire met the Han Empire of China. Buddhist art spread from Gandhara to other parts of Asia. Under Kanishka, Gandhara became a holy land of Buddhism and attracted Chinese pilgrim to see monuments associated with many Jataka tales. 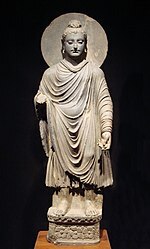 In Gandhara, Mahayana Buddhism flourished and Buddha was represented in human form. Under the Kushans new Buddhists stupas were built and old ones were enlarged. Huge statues of the Buddha were erected in monasteries and carved into the hillsides. Kanishka also built a great tower to a height of 400 feet at Peshawar. This tower was reported by Faxian ([Fa-hsien]), Songyun (Sung-yun) and Xuanzang ([Hsuan-tsang]). This structure was destroyed and rebuilt many times until it was finally destroyed by Mahmud of Ghazni in the 11th century. After Kanishka, the empire started losing territories in the east. In the west, Gandhara came under the Sassanid, the successor state of the Parthians, and became their vassal from AD 241 until 450. The Hepthalite Huns captured Gandhara around AD 450, and did not adopt Buddhism. During their rule, Hinduism was revived but the Gandharan Civilization declined. The Sassanids, aided by Turks from Central Asia, destroyed the Huns' power base in Central Asia, and Gandhara once again came under Persian suzerainty in AD 568. When the Sassanids were defeated by the Muslim Arabs in AD 644, Gandhara along with Kabul was ruled by Buddhist Turks. The travel records of many Chinese Buddhists pilgrims record that Gandhara was going through a transformation during these centuries. Buddhism was declining and Hinduism was rising. Fa-Hsien travelled around AD 400, when Prakrit was the language of the people and Buddhism was flourishing. 100 years later, when Sung-Yun visited in AD 520, a different picture was described: the area had been destroyed by Huns and was ruled by Lae-Lih who did not practice laws of the Buddha. Hsuan-Tsang visited India around AD 644 and found Buddhism on the wane in Gandhara and Hinduism in the ascendant. Gandhara was ruled by a king from Kabul, who respected Buddha's law, but Taxila was in ruins and Buddhist monasteries were deserted. Instead, Hindu temples were numerous and Hinduism was popular. After the fall of the Sassanid Empire to the Arabs in 644, Afghanistan and Gandhara came under pressure from Muslims. But they failed to extend their empire to Gandhara. Gandhara was first ruled from Kabul and then from Udabhandapura (Hind). Gandhara was ruled from Kabul by Turkshahi for next 200 years. Sometime in the 9th century the Hindushahi replaced the Turkishahi. Based on various Muslim records the estimated date for this is 870. According to Al-Biruni (973–1048), Kallar, a Brahmin minister of the Turkshahi, founded the Hindushahi dynasty in 843. The dynasty ruled from Kabul, later moved their capital to Udabhandapura. They built great temples all over their kingdoms. Some of these buildings are still in good condition in the Salt Range of the Punjab. Jayapala was the last great king of this dynasty. His empire extended from west of Kabul to the river Sutlej . However, this expansion of Gandhara kingdom coincided with the rise of the powerful Ghaznavid Empire under Sabuktigin. Defeated twice by Sabuktigin and then by Mahmud of Ghazni in the Kabul valley, Jayapala committed suicide. Anandapala, a son of Jayapala, moved his capital near Nandana in the Salt Range. In 1021 the last king of this dynasty, Trilocanapala, was assassinated by his own troops which spelled the end of Gandhara. Subsequently, some Shahi princes moved to Kashmir and became active in local politics. The city of Kandahar in Afghanistan is said to have been named after Gandhara. According to H.W. Bellow, an emigrant from Gandhara in the fifth century brought this name to modern Kandahar. Faxian reported that the Buddha's alms-bowl existed in Peshawar Valley when he visited around AD 400 (chapter XII). In 1872 Bellow saw this huge begging bowl (seven feet in diameter) preserved in the shrine of Sultan Wais outside Kandahar. When Olaf Caroe wrote his book in 1958 (Caroe, pp. 170–171), this relic was reported to be at Kabul Museum. The present status of this bowl unknown. By the time Gandhara had been absorbed into the empire of Mahmud of Ghazni, Buddhist buildings were already in ruins and Gandhara art had been forgotten. After Al-Biruni, the Kashmiri writer Kalhaṇa wrote his book Rajatarangini in 1151. He recorded some events that took place in Gandhara, and gave details about its last royal dynasty and capital Udabhandapura. In the 19th century, British soldiers and administrators started taking interest in the ancient history of the Indian Subcontinent. In the 1830s coins of the post-Ashoka period were discovered and in the same period Chinese travelogues were translated. Charles Masson, James Prinsep, and Alexander Cunningham deciphered the Kharosthi script in 1838.Chinese records provided locations and site plans of Buddhists shrines. Along with the discovery of coins, these records provided necessary clues to piece together the history of Gandhara. In 1848 Cunningham found Gandhara sculptures north of Peshawar. He also identified the site of Taxila in the 1860s. From then on a large number of Buddhist statues have been discovered in the Peshawar valley. After 1947 Ahmed Hassan Dani and the Archaeology Department at University of Peshawar made a number of discoveries in the Peshawar and Swat Valley . Excavation on many sites of the Gandhara Civilization are being done by researchers from Peshawar and several universities around the world. The Gandharan Buddhist texts are both the earliest Buddhist and South Asian manuscripts discovered so far. Most are written on birch bark and were found in labeled clay pots. Panini has mentioned both the Vedic form of Sanskrit as well as what seems to be Gandhari, a later form (bhāṣā) of Sanskrit, in his Ashtadhyayi. Gandhara's language was a Prakrit or "Middle Indo-Aryan" dialect, usually called Gāndhārī. Texts are written right-to-left in the Kharoṣṭhī script, which had been adapted for Indian languages from a Semitic alphabet, the Aramaic alphabet. Gandhāra was then controlled by the Achaemenid dynasty of the Persian empire, which used the Aramaic script to write the Iranian languages of the Empire. Semitic scripts were not used to write South Asian languages again until the arrival of Islam and subsequent adoption of the Persian-style Arabic alphabet for New Indo-Aryan languages like Urdu, Punjabi, Sindhi and Kashmiri. Kharosthi script died out about the 4th century. However, the Hindko and the archaic Dardic and Kohistani dialects, derived from the local Indo-Aryan Prakrits, are still spoken today, though the Afghan Pashto language is the most dominant language of the region today. Gandharan Buddhist missionaries were active, with other monks from Central Asia, from the 2nd century AD in Han-dynasty (202 BC - 220 AD) China 's capital of Luoyang , and particularly distinguished themselves by their translation work. They promoted both Theravada and Mahayana scriptures. Gandhāra is noted for the distinctive Gandhāra style of Buddhist art, which developed out of a merger of Greek, Syrian, Persian, and Indian artistic influence. This development began during the Parthian Period (50 BC – AD 75). Gandhāran style flourished and achieved its peak during the Kushan period, from the 1st to the 5th century. It declined and suffered destruction after invasion of the White Huns in the 5th century. Image:GandharaFemale.JPG|Female spouted figure, terracotta, Charsadda, Gandhara (3rd–1st century BC)Image:GandharaMotherGoddess.JPG|Mother Goddess (fertility divinity), derived from the Indus Valley tradition, terracotta, Sar Dheri, Gandhara (1st century BC)Image:PrinceSiddhartha.JPG|Prince Siddhartha Gautama Shakyamuni (1st–2nd century)Image:Gandhara_Buddha_(tnm).jpeg|Standing Buddha (1st–2nd century)Image:BuddhaHead.JPG|Buddha head (2nd century)Image:BuddhaAcanthusCapitol.JPG|Buddha in acanthus capitalImage: The Greek-style stupa in SirkapImage: GandharanAtlas.JPG|The Greek god Atlas, supporting a Buddhist monument, HaddaImage:KushanMaitreya.JPG|The Bodhisattva Maitreya (2nd century)Image:Indo-GreekBanquet.JPG|Wine-drinking and music, Hadda (1st–2nd century)Image:MayaDream.JPG|Maya's white elephant dream (2nd–3rd century)Image:SiddhartaBirth.jpg|The birth of Siddharta (2nd–3rd century)Image:LeavingPalace.jpg|The Great Departure from the Palace (2nd–3rd century)Image:EndAscetism.JPG|The end of ascetism (2nd–3rd century)Image:Sarnath3.JPG|The Buddha preaching at the Deer Park in Sarnath (2nd–3rd century)Image:LifeBuddha.JPG|Scene of the life of the Buddha (2nd–3rd century)Image:Paranirvana.JPG|The death of the Buddha, or parinirvana (2nd–3rd century)Image:HaddaSculpture.jpg|A sculpture from Hadda, (3rd century)Image:HaddaBodhisattva.jpg|The Bodhisattva and Chandeka, Hadda (5th century)Image:Buddha-Herakles.JPG|The Buddha and Vajrapani under the guise of HeraklesImage:GandharaScrolls.JPG|Hellenistic decorative scrolls from Hadda, northern PakistanImage:GandharaFrieze.JPG|Hellenistic scene, Gandhara (1st century)Image:StonePalette1.JPG|A stone plate (1st century). c.1900–c.520 BC No records. Indo-Aryan migrations. c.520–c.326 BC Persian Empire Under direct Persian control and/or local control under Persian suzerainty. c.07–c.75 Parthian invasion and Indo-Parthian Kingdom, Rule of Commander Aspavarman? c.1032–1350 Conquered and controlled by the empire of Mahmud of Ghazni. Revue des etudes grecques 1973, p 131, Ch-Em Ruelle, Association pour l'encouragement des etudes grecques en France. Early Indian Economic History, 1973, pp 237, 324, Rajaram Narayan Saletore. Myths of the Dog-man, 199, p 119, David Gordon White; Journal of the Oriental Institute, 1919, p 200; Journal of Indian Museums, 1973, p 2, Museums Association of India; The Pāradas: A Study in Their Coinage and History, 1972, p 52, Dr B. N. Mukherjee - Pāradas; Journal of the Department of Sanskrit, 1989, p 50, Rabindra Bharati University, Dept. of Sanskrit- Sanskrit literature; The Journal of Academy of Indian Numismatics & Sigillography, 1988, p 58, Academy of Indian Numismatics and Sigillography - Numismatics; Cf: Rivers of Life: Or Sources and Streams of the Faiths of Man in All Lands, 2002, p 114, J. G. R. Forlong. Journal of the Oriental Institute, 1919, p 265, Oriental Institute (Vadodara, India) - Oriental studies; For Kuru-Kamboja connections, see Dr Chandra Chakraberty's views in: Literary history of ancient India in relation to its racial and linguistic affiliations, pp 14,37, Vedas; The Racial History of India, 1944, p 153, Chandra Chakraberty - Ethnology; Paradise of Gods, 1966, p 330, Qamarud Din Ahmed - Pakistan. Ancient India, History of India for 1000 years, four Volumes, Vol I, 1938, pp 38, 98 Dr T. L. Shah. IMPORTANT NOTE: Ancient Buddhist text Anguttara Nikaya's list of Mahajanapadas includes the Gandhara and the Kamboja as the only two salient Mahajanapadas in the Uttarapatha. However, the Chulla-Niddesa' list (5th c BCE), which is one of the most ancient Buddhist Commentaries, includes the Kamboja and Yona but no Gandhara (See: Chulla-Niddesa, (P.T.S. ), p.37). This shows that when Chulla-Niddesa Commentary was written, the Kambojas in the Uttarapatha were a predominant people and that the Gandharans, in all probability, had formed part of the Kamboja Mahajanapada around this time—thus making them a one people. Kautiliya's Arthashastra (11.1.1–4) (4th c BCE) refers only to clans of the Kurus, Panchalas, Madrakas, Kambojas etc but it does not mention the Gandharas as separate people from the Kambojas. The Mudrarakshasa Drama by Visakhadatta also refer to the Sakas, Kambojas, Yavanas, Pahlavas, Bahlikas and Kiratas but again it does not include the Gandharas in Chandragupta's army list. The well known Puranic legend (told in numerous Puranas) of king Sagara's war with the invading tribes from the north-west includes the Kambojas, Sakas, Yavanas, Pahlavas, and Paradas but again the Gandharas are not included in Haihayas's army (Harivamsa 14.1–19; e.g Vayu Purana 88.127–43; Brahma Purana (8.35–51); Brahmanda Purana (3.63.123–141); Shiva Purana (7.61.23); Vishnu Purana (5.3.15–21), Padma Purana (6.21.16–33) etc etc). Again, the Valmiki Ramayana—(a later list) includes Janapadas of Andhras, Pundras, Cholas, Pandyas, Keralas, Mekhalas, Utkalas, Dasharnas, Abravantis, Avantis, Vidarbhas, Mlecchas, Pulindas, Surasenas, Prasthalas, Bharatas, Kurus, Madrakas, Kambojas, Daradas, Yavanas, Sakas (from Saka-dvipa), Rishikas, Tukharas, Chinas, Maha-Chinas, Kiratas, Barbaras, Tanganas, Niharas, Pasupalas etc (Ramayana 4.43). Yet at another place in the Ramayana (I.54.17; I.55.2 seq), the north-western martial tribes of the Sakas, Kambojas, Yavanas, Pahlavas, Kiratas, Haritas/Tukharas, Barbaras and Mlechchas etc joined the army of sage Vasishtha during the battle of Kamdhenu against Aryan king Viswamitra of Kanauj. Yaska in his Nirukta (II.2) refers to the Kambojas but not to the Gandharas. Among the several unrighteous barbaric hordes (opposed to Aryan king Vikarmaditya), Brhat Katha of Kshmendra (10.1.285–86) and Kathasaritsagara of Somadeva (18.1.76–78) each list the Sakas, Mlechchas, Kambojas, Yavanas, Neechas, Hunas, Tusharas, Parasikas etc but they do not mention the Gandharas. Vana Parva of Mahabharata states that the Andhhas, Pulindas, Sakas, Kambojas, Yavanas, Valhikas, Aurnikas and Abhiras etc will become rulers in Kaliyuga and will rule the earth (India) un-righteously (MBH 3.187.28–30). Here there is no mention of Gandhara since it is included amongst the Kamboja. Sabha Parava of Mahabharata enumerates numerous kings from the north-west paying gifts to Pandava king Yudhistra at the occasion of Rajasuya amongs whom it mentions the Kambojas, Vairamas, Paradas, Pulindas, Tungas, Kiratas, Pragjyotisha, Yavanas, Aushmikas, Nishadas, Romikas, Vrishnis, Harahunas, Chinas, Sakas, Sudras, Abhiras, Nipas, Valhikas, Tukharas, Kankas etc (Mahabharata 2.50–1.seqq). The lists does not include the Gandharas since they are counted as the same people as the Kambojas. In context of Krsna digvijay, the Mahabharata furnishes a key list of twenty-five ancient Janapadas viz: Anga, Vanga, Kalinga, Magadha, Kasi, Kosala, Vatsa, Garga, Karusha, Pundra, Avanti, Dakshinatya, Parvartaka, Dasherka, Kashmira, Ursa, Pishacha, Mudgala, Kamboja, Vatadhana, Chola, Pandya, Trigarta, Malava, and Darada (MBH 7/11/15–17). Besides, there were Janapadas of Kurus and Panchalas also. Interestingly, no mention is made to Gandhara in this list. Again in another of its well known Shlokas, the Mahabharata (XIII, 33.20–23; XIII, 35, 17–18), lists the Sakas, Yavanas, Kambojas, Dravidas, Kalingas, Pulindas, Usinaras, Kolisarpas, Mekalas, Sudras, Mahishakas, Latas, Kiratas, Paundrakas, Daradas etc as the Vrishalas/degraded Kshatriyas (See also: Comprehensive History of India, 1957, p 190, K. A. N. Sastri). It does not include the Gandharas in the list though in yet another similar shloka (MBH 12.207.43–44), the same epic now brands the Yavanas, Kambojas, Gandharas, Kiratas and Barbaras (Yauna Kamboja Gandharah Kirata barbaraih) etc as Mlechcha tribes living the lives of the Dasyus or the Barbarians. Thus in the first shlokas, the Gandharas and the Kambojas are definitely treated as one people. The Assalayana-Sutta of Majjima Nakaya says that in the frontier lands of the Yonas a, Kambojas and other nations, there are only two classes of People...Arya and Dasa where an Arya could become Dasa and vice-varsa (Majjima Nakayya 43.1.3). Here again, the Gandharas are definitively included among the Kambojas as if the two people are same. Rajatarangini of Kalhana, a Sanskrit text from the north, furnishes a list of northern nations which king Lalitaditya Muktapida (Kashmir) (8th c AD) undertakes to reduce in his dig-vijaya expedition. The list includes the Kambojas, Tukharas, Bhauttas (in Baltistan in western Tibet), Daradas, Valukambudhi, Strirajya, Uttarakurus and Pragjyotisha respectively, but no mention of Gandharas (Rajatarangini: 4.164–4.175). Apparently the Gandharas are counted among the Kambojas. Sikanda Purana (Studies in the Geography, 1971, p 259–62, Sircar, Hist of Punjab, 1997, p 40, Dr L. M. Joshi and Dr Fauja Singh (Editors)), contains a list of 75 countries among which it includes Khorasahana, Kuru, Kosala, Bahlika, Yavana, Kamboja, Siva, Sindhu, Kashmira, Jalandhara (Jullundur), Hariala (Haryana), Bhadra (Madra), Kachcha, Saurashtra, Lada, Magadha, Kanyakubja, Vidarbha, Kirata, Gauda, Nepala etc but no mention of Gandhara in this list of 75 countries. Kavyamimasa of Rajashekhar (880–920 AD) also lists 21 north-western countries/nations of the Saka, Kekaya, Vokkana, Huna, Vanayuja, Kamboja, Vahlika, Vahvala, Lampaka, Kuluta, Kira, Tangana, Tushara, Turushaka, Barbara, Hara-hurava, Huhuka, Sahuda, Hamsamarga (Hunza), Ramatha and Karakantha etc but no mention of Gandhara or Darada (See: Kavyamimasa, Rajashekhara, Chapter 17; also: Kavyamimasa Editor Kedarnath, trans. K. Minakshi, pp 226–227). Here in both the lists, the Daradas and Gandharas are also treated as the Kambojas. The Satapancasaddesavibhaga of Saktisagama Tantra (Book III, Ch VII, 1–55) lists Gurjara, Avanti, Malava, Vidarbha, Maru, Abhira, Virata, Pandu, Pancala, Kamboja, Bahlika, Kirata, Khurasana, Cina, Maha-Cina, Nepala, Gauda, Magadha, Utkala, Huna, Kaikeya, Surasena, Kuru Saindhava, Kachcha among the 56 countries but the list does not include the Gandharas and Daradas. Similarly, Sammoha Tantra list also contains 56 nations and lists Kashmira, Kamboja, Yavana, Sindhu, Bahlika, Parsika, Barbara, Saurashtra, Malava, Maharashtra, Konkana, Avanti, Chola, Kamrupa, Kerala, Simhala etc but no mention of Daradac and Gandhara (See quotes in: Studies in Geography, 1971, p 78, D. C. Sircar; Studies in the Tantra, pp 97–99, Dr P. C. Bagchi). Obviously, the Daradas and Gandharaa are included among the Kambojas. Raghu Vamsa by Kalidasa refers to numerous tribes/nations of the east (including the Sushmas, Vangas, Utkalas, Kalingas and those on Mt Mahendra), then of the south (including Pandyas, Malaya, Dardura, and Kerals), then of the west (Aprantas), and then of the north-west (like the Yavanas, the Parasikas, the Hunas, the Kambojas) and finally those of the north Himalayan (like the Kirats, Utsavasketas, Kinnaras, Pragjyotishas) etc (See: Raghuvamsa IV.60 seq). Here again no mention of the Gandharas though Raghu does talk of the Kambojas. And last but not the least, even the well known Manusmriti, the Hindu Law Book, refers to the Kambojas, Yavanas, Shakas, Paradas, Pahlavas, Chinas, Kiratas, Daradas and Khasha besides also the Paundrakas, Chodas, Dravidas but surprisingly enough, it does not make any mention of the Gandharas in this very elaborate list of the Vrishalah Ksatriyas (Manusamriti X.43–44). The above references amply demonstrate that the Gandharas were many times counted among the Kambojas themselves as if the were one and the same people. Thus, the Kambojas and the Gandhara do seem to have been a cognate people. There are also several instances in the ancient literature where the reference has been made only to the Gandharas and not to the Kambojas. In these cases, the Kambojas have obviously been counted among the Gandharas themselves. Kalimpur Inscriptions of Pala king Dharmapala of Bengal (770–810 AD) lists the nations around his kingdom as the Bhoja (Gurjara), Matsya, Madra, Kuru, Avanti, Gandhara and the Kira (Kangra) which he boasts of as if they are his vassal states. From Monghyr inscriptions of king Devapala (810–850AD) the successor of king Dharmapalal, we get the list of the nations as Utkala (Kalinga), Pragjyotisha (Assam), Dravida, Gurjara (Bhoja), Huna and the Kamboja. THese are the nations which cavalry of Pala king Devapala is said to have scoured during his war expeditions against these people. Obviously the Kamboja of the Monghyr inscriptions of king Devapala here is none else than the Gandhara of the Kalimpur inscription of king Dharamapala. Hence, the Gandhara and the Kamboja are used interchangeably in the records of the Pala kings of Bengal, thus indicating them to be same group of people. James Fergusson observes: "In a wider sense, name Gandhara implied all the countries west of Indus as far as Candhahar" (The Tree and Serpent Worship, 2004, p 47, James Fergusson). Encyclopedia Americana, 1994, p 277, Encyclopedias and Dictionaries. Herodotous, The Histories, Translated by Aubrey De Selincourt, Penguin Books, 1954. Hill, John E. 2003. "Annotated Translation of the Chapter on the Western Regions according to the Hou Hanshu". 2nd Edition.